Bengaluru: Traffic safety is extremely important and the Bangalore Traffic Police had very recently successfully captured the attention of the locals and traffic offenders in the city with a person dressed as Lord Yamraj. In the aftermath of that, and to cash in on the festivities around Ganesh Chaturthi, India’s leading FM radio network, 93.5 RED FM joined hands with the Bangalore Traffic Police to get ‘Lord Ganesha’ to spread the importance of protective head gear. A person dressed as the deity caught hold of traffic offenders, made them do ‘baski’ as a symbolic act of asking forgiveness to the Lord and distributed free helmets to spread the message of road safety. The campaign ‘Second Chance Nahi Milega’ draws inspiration from mythology to say that while Lord Ganesha ended up with an elephant’s head after being beheaded by Lord Shiva, most people are not fortunate to get a second head, or for that matter, a second chance in life! 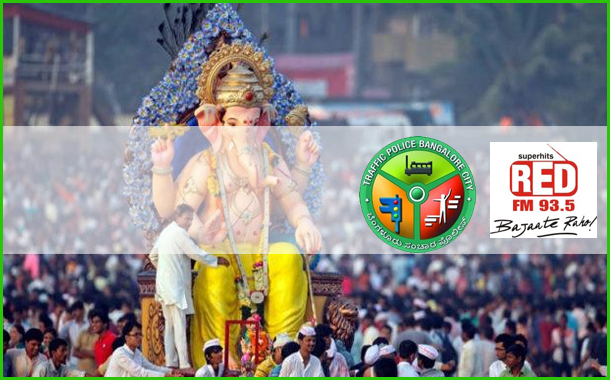 The on-ground campaign as well as on-air promotions to raise awareness, focused on this message to connect with the sentiments of Bengalureans around the festival of Ganesh Chaturthi. The initiative also saw the involvement of volunteers of the NGO ‘Being Social’ who worked tirelessly with RED FM and the Bangalore Traffic Police to drive the message on ground.